Getting high in the sky. What separates ordinary from extraordinary is perspective. Or the leftover baggie of shrooms in your back pocket. Cyrena Lee blurs the line between work and play when a business trip turns into a mindbending airborne experience. NEW YORK CITY – I woke up with a start the wintry morning of a 7 a.m flight to Chicago. I've had a strange fear of missing flights ever since an extended lunch left me stranded in Casablanca, and, sure enough, I thought I overslept. In the dark hours before sunrise, I quickly zipped my suitcase and fumbled out the door. In the cab to LaGuardia, I realized that I had forgotten to pack my gloves and to unpack the leftover mushrooms from a weekend upstate. My cold fingers thumbed the bag and I weighed my options. Wasting the shrooms was not one of them, and neither was a confrontation with the TSA. And so, reader, I ate them. Bold decision. I know it seems a little crazy, but my 2015 resolution was to blur the lines between work, life, and play and to push new boundaries. What better way than to travel for work with some hallucinogenic-addled pleasure? The drugs started to kick in at check-in. I felt a wobbly sensation overtake me, my senses on high alert. I was suddenly all too aware of the artificial, harsh lighting everywhere. If you've never done mushrooms before, an airport is not the place to start. The beauty of fungus is that it brings to life the natural, inherent beauty of the world. How alive everything is. If you want to shroom or the first time, you should start in a forest. I could see the cold, constructed world of LaGuardia with an entirely new lens. I was tripping on my trip, getting high in the sky. But first I had to remain focused. The digital check-in stand spat out my flimsy boarding pass and luggage tag. I saw the words "TEAR HERE" and obliged willingly, only to be scolded by a staff member that I'd ripped it in half and that a new one would have to be printed. She disappeared with my ID and boarding pass for what seemed like forever, and I had to ward off a slight panic attack and the thought that she was just a figment of my imagination. (Thank you, meditation, for the training in slow, concentrated breathing.) She returned and took my bag. Freed of the extra weight, I made my way through the sleepy airport to security, an area animated with a harried mess of passengers uniformly stripping, assembly-line style, to get to the gates. I breathed a sigh of relief when I made it through security unscathed. (Didn't they know?) I bought a bottle of water. "$5.83," the robotic teenage clerk told me. So short. So practiced. So bored. I gave him a goofy smile, trying to uplift the monotony of his morning. Ears buzzing, I sat down at the gate and waited to board. Everyone around me was a zombie, either sleeping or scrolling endlessly through their smartphone. A pretty Asian girl with comically large glasses and perfect makeup across from me was attempting to eat a sandwich enveloped in plastic with one hand — the other was permanently attached to her iPhone. I was sure I saw a dark cloud of discontent shadowing the face of a dark-haired, greasy young man who was also sitting alone, spacing out. Then again, maybe he was just high on something else. Nobody is really awake at 6:30 in the morning. Or maybe ever. I closed my eyes to breathe and pretended I was a completely normal person, bored while waiting for her flight to board. On the gangway to the plane, the excitement of impending travel kicked in, and I started to giggle. Because I was tripping balls. This was definitely one of the boldest life choices I've made. When I walked through first class, everything became a little Fear and Loathing in Las Vegas. A young blond dude who looked like Patrick Bateman in headphones glared at me for a split second before returning to the business section of his newspaper. His eyes darted around quickly, hungry for that next deal. Is he a werewolf? His teeth looked a little fang-y. A young couple in puppy love sat together, leaning in close to debate which movie to watch. Were they panda bears? They were dressed in black and white. A smug, older man who looked like Salman Rushdie in an expensive merino wool sweater sat with his eyes looking down at his phone, balanced on his large stomach. Was he....Buddha? Pause for a reality check: I remembered that I had a job handling social media, and snapped a photo out a window. Oblivious to the travel experience. Photo by Cyrena Lee. I settled into my seat, nestled between two strangers. The guy to my left smiled as if he wanted to strike up a conversation. I smiled back blankly because I couldn't remember if I had adjusted my seat in the 30 seconds since I had sat down. The girl to my right pulled down the window shade, put on an eye mask, and dozed off. Some window seat neighbor she was, denying us a view. Who does she think she is, controlling the collective sunlight in row 21? Maybe it was the shrooms, but I noticed how jaded travelers are. All the passengers settled in and checked out, leaning back, eyes closed, anxious to get to their destination. 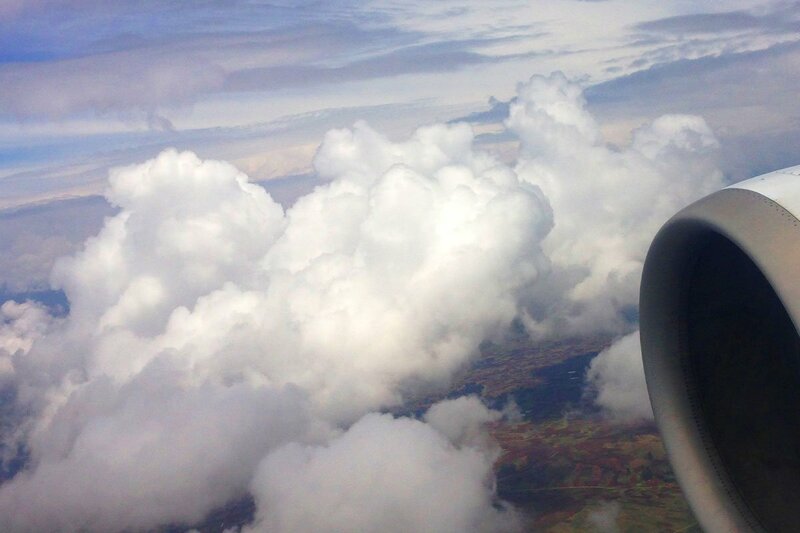 Everyone was missing the best part of airplane travel: take-off. Why doesn't anyone get excited about the sensation of going from ground to air anymore? I soaked it all in. The gentle rumble of the airplane that escalated into a loud whirring at lift-off. The beautiful sunrise light cascading through any open windows. The practiced, cheery speech of the flight attendants to those in exit rows. The way I could feel the plane dipping up and down through the air. The anticipation of going somewhere exciting, heart racing like the ascent of a roller coaster. The sheer incredible magic of flight. Tears of joy started streaming down my face. I couldn't stop smiling, biting my lip to contain my laughter at the absurdity of the situation. Even the frightened meows of a poor caged cat in the row behind me was hilariously beautiful. I drank my water, replenishing the liquid being lost from my leaking eyes. 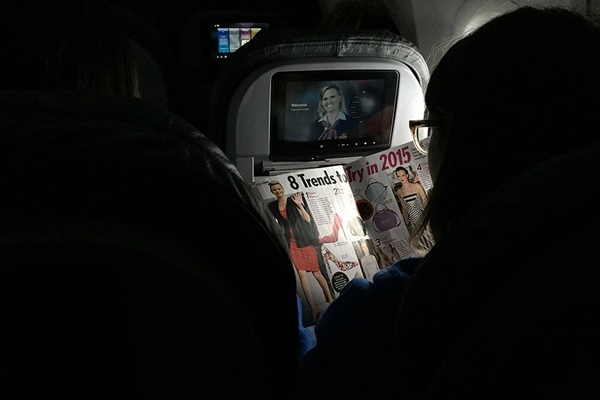 A blonde girl seated in front of me was thumbing through a tabloid. I couldn't stop staring at the content that was so clearly brainwashing propaganda for mind-numbing consumerism. The headlines were terrifying, barely concealing their true insidious nature. 8 TRENDS TO TRY IN 2015 really means "Useless Fast Fashion to Buy in an Attempt to Emulate Celebrities with Far Less Money But Still Money You Probably Shouldn't Spend." She flipped a page. $26 MILLION DOLLAR CASTLE. "Real Life Barbie Dream House Distraction for Grown-ups Who Should Invest in a 401K Instead." I wrote down these all of these observations in my Moleskine, and made lists of my friends who don't ever read tabloids that I owed letters to, to tell them how much I loved them. I really do love them. The stewardesses strolled down the aisles with their metal beverage cart for a second time, indicating that landing was at hand. Time, of course, meant nothing to me. I asked for a cup of coffee. It was terrible and smelled toxic, but I was grateful to have it to sober up a bit. A few sips later, I had to face my biggest challenge yet: moving to go to the bathroom. I asked a flight attendant, "Um, excuse me, do you think, do you think that I have enough time to go to the bathroom?" Again, time, a concept I was struggling with. He mumbled "yeah" and scurried away, giving me a look as if I had just asked if I could lick his forehead. I made it to the bathroom and took a look in the mirror: My hair was a mess and my face red and puffy, still sticky from the rows of dried tears. Super professional, I thought to myself. Don't freak out, I told the mirror. (Thank you again, meditation practice.) I washed my face to make myself somewhat presentable. The landing was smooth, and suddenly I was in Chicago. It was lively at 9 a.m. and noticeably brighter and lighter than New York. I sent a text message to my co-workers on an earlier flight from Boston to tell them I had landed and not to wait for me. They called me to inform me that they had checked bags, so wait they would. I gulped and texted one of them the following: "Hey. So, I had some leftover mushrooms in my bag and on the way to the airport I kind of ate them because of security...and yeah. Just FYI. That's where my head is right now. Don't tell anyone." When I found them, I discovered that he had read the text out loud. Lesson learned: always start text messages with a disclaimer at the beginning. They greeted me with smiles and made it clear that I would never live this one down. My trip ended, but my journey was far from over. The best part of a trip can be each and every moment. You just have to pay attention. Вы можете тестостерон купить у нашего менеджера.